Home CAVS NBA NBA FINALS SPORTS STEPHEN CURRY Stephen Curry got robbed of NBA Finals MVP title? 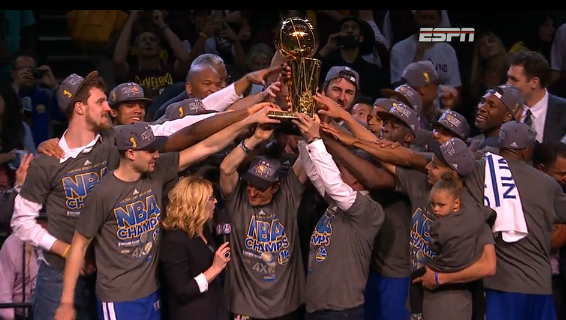 The 2015 NBA Finals MVP was not Stephen Curry though, but it's Andre Iguodala, who was never in the Starting 5 of the Golden State Warriors in this whole Cavs-Warriors series. Was Steph Curry robbed of the Finals MVP? Did they just avoid to award a first-time Season's MVP with the coveted Finals MVP? 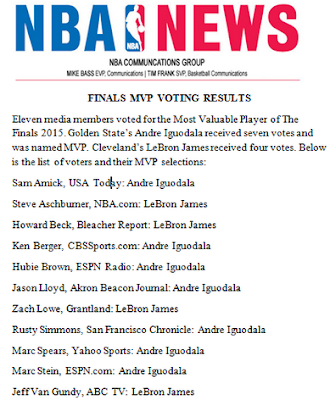 Before Game 6, NBA Finals 2015 predictions had either Iguodala or Curry for the Finals MVP, with many also saying LeBron could be a deserving MVP awardee even if he's on the losing team. I was actually ambitious to believe that the latter was going to happen. No debate. LeBron played so well in the 2015 NBA Finals, averaging almost a triple-double, which was something hard to match, either by Iguodala or Curry. He would have been only the 2nd NBA player from the losing team to be hailed Finals MVP. But that didn't happen. Official media voting for the Finals MVP, as shown in the photo by @ESPNNBA, revealed that the award was only between Iguodala and LeBron: the former got 7 votes, while the latter had 4. As you can see, no one voted for Steph Curry to become the Finals MVP. Who's the real NBA Finals MVP for 2015?